Away from the clamour of the referendum campaign, opinion polls on voting intention at the general election are continuing to be produced like clockwork. And so far this month they’ve been showing some striking trends. Despite being knocked out of the headlines by Scotland, Ukip have undoubtedly benefited from the publicity generated by Douglas Carswell’s defection. The party seems to be bouncing back from the decline it suffered after its previous bounce (let it never be said Ukip has a stubborn, unchanging chunk of support). So far in September the party is averaging 15.1%: that’s up almost two percentage points on August, and the highest monthly average Ukip has scored since May 2013. The other three parties have all taken a hit, but the Tories are suffering the most, down from 33.2% in August to 31.7% this month. 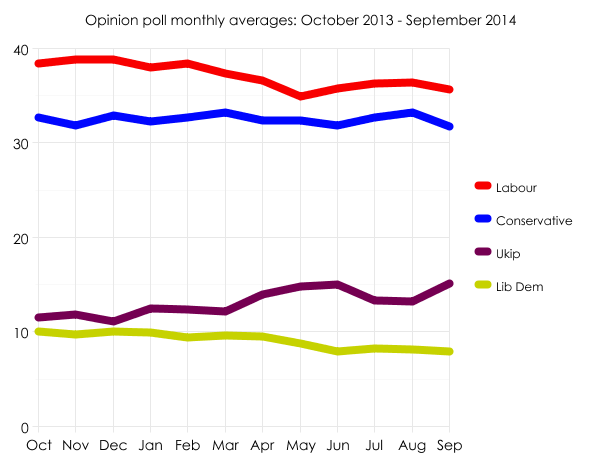 Labour has fallen as well, but not by as much. And intriguingly, the trends have opened up a larger gap between Labour and the Tories than of late – the largest it’s been since March 2014, in fact. 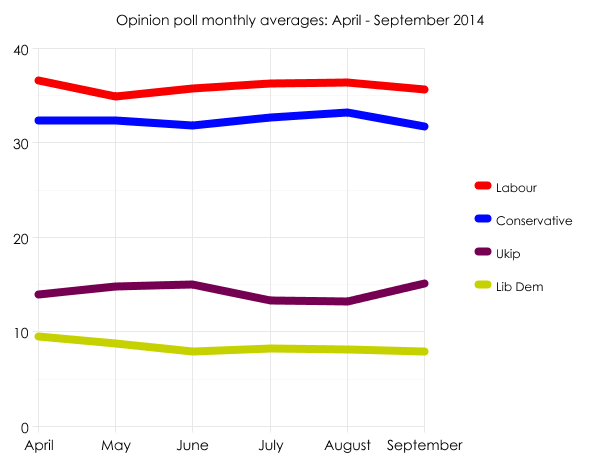 Labour is currently tracking at 35.7%, down from 36.4% in August, but a full four points ahead of the Conservatives. As for the Lib Dems, they’ve sunk below the fateful 8% once again, a place they have been only once before in the entire life of this parliament (June 2014). They are currently averaging 7.9%. It appears the media’s focus on the referendum has not hurt Ukip whatsoever – though it has to be said the campaign has exclusively dominated the headlines only since last weekend. It’ll be fascinating to see how the result of the referendum and consequent upheaval helps or hinders all the main parties in the polls. Either way, remember that even if Scotland votes Yes, there will be a general election next year, and it will involve the entire UK. Scotland would not leave the union until spring 2016 at the earliest; until then, and for as long as it remains part of the UK, it will continue to send MPs to the UK’s parliament.